When people have bulging neck veins, it is referred to as jugular vein distention and can be a sign of a cardiovascular problem. If you have jugular vein distention or as it is commonly called, JVD, you should seek medical attention immediately. 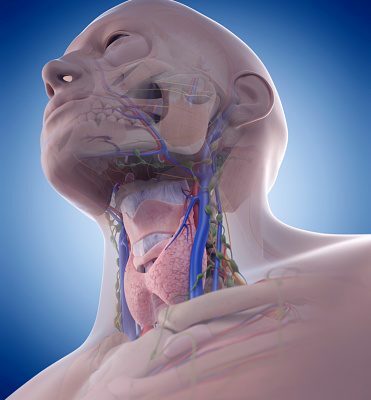 We have internal and external jugular veins that run along the right and left side of our neck. These veins carry blood from the head to the superior vena cava. The vena cava is the largest vein in the upper body and it runs to the heart, which is where blood is before passing through the lungs to pick up oxygen. When someone has jugular vein distention, it is a sign of increased pressure inside the vena cava. What are the causes and complications of jugular vein distention? Bulging neck veins can be serious. An abnormally high level of pulse in the jugular veins is often used as the jugular vein distention definition. It is one way to explain increased pressure on the veins in the right side of the heart. So how does this happen? This means that your heart is too weak to pump enough blood to meet the needs of your body. Right-sided heart failure develops after left-sided heart failure. When the left ventricle’s pumping becomes weak, it can cause fluid to back up into the lungs, which then weakens the right ventricle. When blood backs up into the veins, it causes a bulge. When the pressure in your lungs increases, it sometimes leads to right-sided heart failure. This can happen if there are changes to the lining of your artery walls. This occurs when the valve separating the right atrium and the right ventricle becomes stiff. It may be unable to open enough to let blood flow so it backs up in the atrium, thus causing excess blood in the veins, including the jugular vein. Although rare, this happens when a tumor in the chest restricts blood flow in the vena cava vein. The pericardium is a thin, fluid-filled sac surrounding the heart. An infection in the pericardium can restrict the volume of the heart and the chambers won’t fill with blood properly. As a result, blood can back up into veins. this term refers to increased blood volume or too much fluid, which can lead to heart failure. This is the rapid deterioration of the heart’s ability to pump blood. This can happen when the sac around the heart fills with blood or other fluid. While it is helpful to understand the causes of jugular vein distention, many people are curious about risk factors. The obvious risk factor is heart failure, but lets look deeper. If you have chronic blood pressure your chances of experiencing heart failure are higher than those who have no issues with their blood pressure. Those who have coronary artery disease are also at higher risk for heart failure and so are people with heart valve disease and irregular heart rhythms. If someone is diagnosed with heart failure, they should work closely with their healthcare team to manage their condition and prevent complications. Below is a list of possible complications associated with jugular vein distention when the condition goes untreated. Jugular vein distention symptoms vary depending on what is causing the condition. Any symptoms that affect the blood vessels and heart may also involve other systems within the body. For instance, many people with jugular vein distention experience circulatory symptoms, while others experience neurological symptoms. The following list covers off many of the bulging vein symptoms doctors have reported in patients. There are jugular vein distention symptoms that could signal a life-threatening condition. If someone experiences anxiety, profuse sweating, bluish colored lips or fingernails, chest pain, heart palpitations, rapid heart rate, breathing problems, wheezing, choking, or can’t produce any urine, immediate medical attention should be sought. So you might be wondering how to check for jugular vein distention. Usually, a patient lies down and is positioned at 45 degrees along the filling levels of the vein. With a beam of light, the doctor will look along the surface of the sternocleidomastoid muscle to try to observe any movement or pulsations in the neck. In order to get an accurate view, the doctor should move from left to right, at a right angle, rather than coming towards the vein. While a pulsing jugular vein can be hard to see, cardiologists are trained to look for signs of central venous pressure. A full jugular vein distention assessment will include a review of the patient’s medical history, along with a physical exam. The physical examination will likely include looking for normal pressure in the veins, as well as conducting an ECG to see if there are any heart blocks, right ventricular infarction, atrial fibrillation or other medical issues. A chest x-ray may also be ordered to rule out congestive heart failure. Many doctors will also order blood tests to assess kidney and liver function. Jugular vein distention treatment often begins with a combination of lifestyle changes and medications. Heart failure medications, including beta-blockers, which are known to reduce workload on the heart and lower blood pressure, are commonly prescribed. Diuretics are also a possible treatment option to help control extra fluid that can occur with heart failure. Some people who suffer from jugular vein distention are suffering from ventricular tachycardia and may be treated with antiarrhythmic medications. In some situations, a pacemaker may be needed if there is a heart block. If a patient is experiencing severe symptoms due to tricuspid stenosis, surgery may be needed. There is no way to skirt it; jugular vein distention is often a sign of heart failure. Having said this, getting a quick assessment, having a positive outlook, and following treatment will give you a better chance at a good outcome. If you or someone you know appears to have a bulging neck vein, don’t hesitate – make sure that it gets checked out sooner rather than later.